The exact definition of Marketing Automation is still germinating. At its narrowest, it involves email marketing only, but at its broadest, it refers to every aspect of online branding or cloud marketing. This means efficiently managing a company’s sales and marketing efforts across multiple connected online channels. 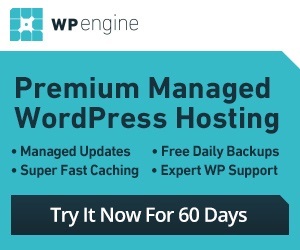 In this broad definition, it embraces email, SMS, (dynamic) website content/CMS, social listening, social media posting, paid search, natural search, webinars, surveys, CRM integration and more. A Marketing automation platform, such as Pardot, ExactTarget, or even Dotmailer centralizes marketing assets and related data, which then enables the execution of marketing activities across these channels. A core functionality of marketing automation platform is a drip program. This allows your company to nurture prospects through a series of personalized communication in which your marketing team can offer prospects useful, tailored content. In the process you move from general educational materials to more specific usage information and product features. As you let your customers get to know you, the objective is for you to also get to know them through progressive profiling. Marketing automation is an efficient tool to be personal and professionally branded in every email, despite the fact that you are sending out ‘000s of emails in your campaigns. Marketing automation works by automating repeated marketing tasks, allowing your company to focus on marketing content personalization and converting leads instead. Personalization and the provision of relevant (dynamic) content supports the conversion of prospects into buying customers. But don’t only focus on bringing in new leads. These aspects of marketing automation also transform regular customers into loyal customers. The key to this is their increasing engagement and affinity with your brand. 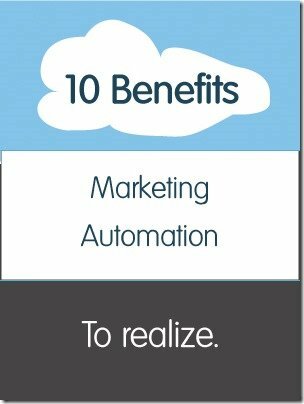 To detail what marketing automation is and how it can work to your advantage, here is an overview of 10 sales, marketing and business benefits to realize. This is not an exhaustive list, but entails the most important benefits. ENHANCED, PERSONALIZED CUSTOMER RELATIONSHIPS: Marketing Automation gives you a comprehensive, unified customer view. By having this 360 view, you are able to create targeted, personalized communication and build personal relations with thousands of customers 1:1. It permits you to design and manage online experiences for prospects and customers that are highly targeted. What you’ll offer them will be more relevant. MARKET SEGMENTATION: As well, Marketing Automation makes it possible for you to instantly divide your market into market segments consisting of customers with similar characteristics. This then let’s you focus on your most profitable market segments. With a sophisticated Marketing Automation platform, you will for example be able to segment by company size, geography, industry, sales history with easy. MULTI-CHANNEL MANAGEMENT: Now companies are engaging in market and customer communication on various social media platforms. Besides all this ‘engaging’, they are conducting online and offline marketing as well. With so many initiatives, it can be really difficult to understand the ROI of each advertising project and each marketing channel. Now this is where a sophisticated Marketing Automation platform gives you the helping hand you need: it tracks for you exactly where your leads are coming from. What a relief! BRANDING: By automating your online marketing activities, here’s the core benefit: consistency. This consistency is important for brand building. Marketing automation help you deliver a coherent marketing story, consistent brand values, plus a systematic social media and sales management strategy. Unified marketing messages, both in words and visuals, explicit and subliminal, lead to strong brand. Marketing automation can further help you to cross-pollinate various marketing campaigns across multiple channels. Last but not least, your marketing automation platform can work as a marketing asset closet, making it easy to store, organize and re-use your various marketing content files. SALES MANAGEMENT: A most commonly recognized benefit of marketing automation is its sales management. Marketing Automation is a great opportunity tracking management tool for advanced account planning and pipeline management. You can gain a clear visual and numeric view of each stage in your sales funnel. This tells you where to put your immediate sales and marketing efforts to ensure consistent sales growth. You can set your Marketing Automation software to report on metrics that are relevant to your sales team. SALES & MARKETING INTEGRATION: Marketing Automation allows you to integrate and consolidate your currently separate marketing and sales support systems. BUSINESS TRANSPARANCY: Marketing automation can give you a clearer vision of where you’re heading. The more sophisticated Marketing Automation platforms, such as Pardot, offer you extensive Reporting possibilities. Provided you have set things up properly, you can accurately track your ROI of individual marketing campaigns and activities using Marketing Automation. EFFICIENCY: By automating key processes, cloud-based marketing automation lets you accomplish time-consuming online sales and marketing jobs faster and more efficiently. RAPID DEPLOYMENT: Your company can realize real benefits from a Marketing Automation platform within mere months, rather than within years. Within those few months, you can select and sign up for your cloud-based Marketing Automation platform, configure your platform, create some of your required marketing assets, and get the platform to work for your business. You most likely start with a ‘quick win’ pilot project, during which time you commence your change management and staff training to work with the new system. After the pilot, you’ll be able to more full appreciate the marketing automation’s potential. That’s the time to plan to a roll out of dovetailing marketing implementation projects to benefit for years from your new marketing automation platform. LOW RISK: As most/all cloud-based Marketing Automation platforms offer a scalable monthly fee structure, your IT investment risk is curtailed to an absolute minimum. This makes marketing automation such an obvious thing to do from an IT point of view. I’d say it also lowers your risk of your marketing campaigns as well. Because of easy A/B testing, increased insights and meaningful performance analytics available during your campaigns, you will be able to steer it and correct any errors or oversights, and replace existing methods with best practices even during a campaign to maximise its benefits. Marketing automation is incredibly powerful. It will not only give you much better insight in, and help create your customers’ journey, it will also be your journey as a marketer towards increasing sophistication with the tools and possibilities in marketing automation as they unfold. 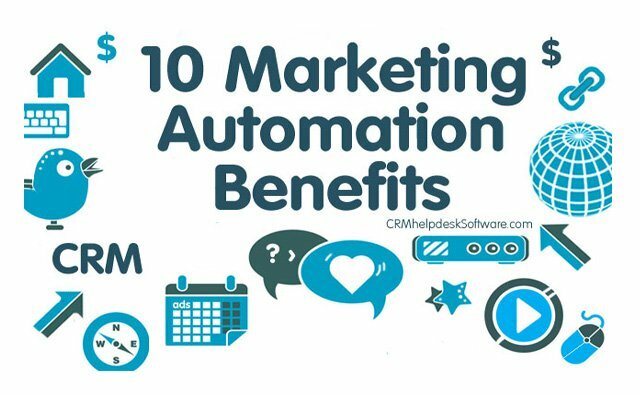 Benefits of Marketing Automation for your business are obviously influenced by the nature of your industry and how you would like to adopt Marketing Automation. Once you are looking at Marketing Automation more closely, you may will discover additional benefits and ways that it could help you transform your business and gain a competitive advantage in your specific markets. I can not stress enough, that as the adoption of marketing automation is still relatively untapped in many industries, companies can leap ahead of competition if they simply begin today learning how they can get closer to their customers. Because simply put, if you don’t do it now, and your competitor start wooing these prospects instead, there will be fewer potential customers for you to serve tomorrow. Companies who adopt marketing automation simply grow faster, and outpace peers.